Crystal Scott's Paleo Rx gets dieters in line with the paleo way with prepared meals. 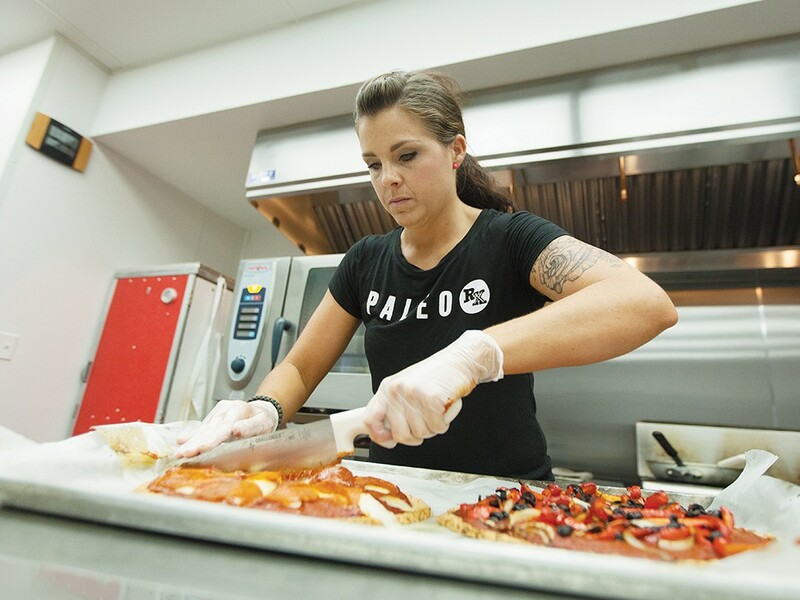 The aroma of pepperoni fills the commercial kitchen as Crystal Scott carefully pulls a hot tray out of the oven. Cavemen didn’t eat pizza. They never knew what they were missing. But modern humans who follow the increasingly popular Paleo diet — they know. That’s why Scott is putting on the table a steaming-hot answer to a difficult riddle: How do you make a pizza with only ingredients a caveman might have eaten — without cheese, grains, eggs or soy? Scott started preparing Paleo recipes for her family several years ago, and late last year started a business, Paleo Rx, that offers a colorful menu of meals like bacon meatloaf, chicken enchiladas and honey cinnamon pork over apples, delivered in individually labeled containers. The Paleo diet, popularized through the CrossFit fitness training program, urges eating only foods our ancient hunter-gatherer ancestors might have eaten before the advent of farming. Heavy on meat, fresh fruits and vegetables, with healthy fats like olive oil and avocados, it has some characteristics in common with other healthful diet plans — no processed foods, no refined sugars — but also eschews some food groups typically considered healthful, like legumes and whole grains. That pizza steaming on the counter? To avoid grains, the vegan crust is a made-from-scratch mix that includes almond flour and cauliflower. The coconut milk “cheese” is indistinguishable from mozzarella. Scott counts on her fingers the various diets she’s tried in the past — “every diet out there,” she says — and credits this one as a turning point in improving her health and spurring her interest in nutrition. She’s now in school to get her master’s in nutrition. “I’m healthier at 32 than I ever was at 22,” she says. The biggest challenge in sticking with the Paleo diet isn’t a lack of variety — it’s a lack of time. Because eating Paleo-style requires so much fresh meat, fruit and vegetables, meals are time-consuming to shop for and prepare. Modern humans don’t have all day to hunt, gather and worry about the next meal. Businesses like Paleo Rx are bridging the gap, with prepared meal plans that combine prehistoric nutrition with a very modern emphasis on convenience. Twice a week, Paleo Rx meals are delivered to clients at their gyms or homes in individually labeled containers. Each meal is carefully planned and weighed to also adhere to the measuring-based Zone diet, also popular in the CrossFit community. Each week the business goes through hundreds of pounds of grass-fed beef, free-range chicken and other fresh fish and meat. A whole side of the walk-in cooler is filled with asparagus, broccoli and boxes of other produce when they get their weekly delivery. A similar business called On The Go Paleo got started several months ago, almost by accident. After Vanessa Wesley moved to Spokane last year, a friend got her interested in trying a class at CrossFit Spokane Valley. CrossFit emphasizes that nutrition is key for performance, and encourages people to think of “diet” in the broader sense of what fuels an active body. When Dan Staton, the owner of the gym, heard that Wesley had a culinary school degree and a background in catering, he suggested she might be able to help people struggling with their nutrition goals. “I said to her, ‘Hey, help me win that battle,’” he says. Wesley had already been avoiding dairy and gluten for a long time, but she wanted to make sure the Paleo diet was something she could get behind. Now a lot of her clients aren’t even involved with CrossFit, and got interested in the Paleo diet other ways. Many of them had resorted to making the same Paleo meals over and over, and Wesley is trying to “expand people’s taste buds” with flavors and ideas they might not prepare for themselves. A favorite so far is pulled pork barbecue with mashed cauliflower instead of mashed potatoes. A Banh Mi salad was a recent hit. Both Scott and Wesley say they don’t eat Paleo exclusively — they aim for the “80/20” mix promoted in the Paleo community as a way to keep the diet realistic and not overly restrictive. Scott says she’s learned it’s a good idea to go out and “cheat” with a really bad meal every once in a while, if only to notice how much worse she feels afterward.